Lauren grew up in Tampa, Florida and currently lives in Austin, Texas. She made her first movie when she was a teenager, about a girl who falls madly in love with a computer. Her art is influenced by science fiction, surrealism, disabilities culture, feminism, literature and art. She often explores political ideas through a fantastical lens. Lauren is in-development on her first feature film, a multi-generational feminist art heist, as well as several television projects in collaboration with other writers. Her films have played SXSW, Hot Springs Doc Fest, CinemaEast, Oakland Underground, Atlanta Philosophy Fest and more. She is the recipient of an Austin Film Society Grant. Lauren has an MFA from the University of Texas at Austin where she currently teaches. 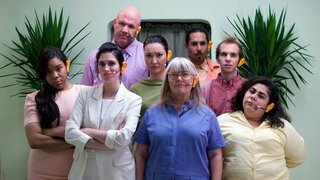 Director, Co-Writer and Co-Editor Lauren Kinsler answers some questions from PBS about the unique setting and storyline of U R a Dial Tone, from the wardrobe to being a sign language interpreter. Read the Full Q&APBS: How did a plot like this come to you? Lauren Kinsler: I have worked as a sign language interpreter for over 10 years in the community and interpreting phone calls. It's a difficult job and I was interested in exploring an optimistic and hard working woman who is trying her hardest to be professional but struggles with aspects of her job that require her to keep her personality hidden. The company Deafinity is trying very hard to be cool, while implementing increasingly oppressive tactics to making sure their employees stay in line. These two opposing forces come together to create the plot of the film. KLRU-TV, Austin PBS is dedicated to telling stories that entertain, inspire and change our lives. KLRU highlights what makes Austin unique – whether music, arts or public issues – by creating and distributing award-winning original content. KLRU produces several series including Austin City Limits, Arts In Context, Central Texas Gardener and Overheard with Evan Smith. As a nonprofit educational organization, KLRU also prepares children to succeed in school and creates lifelong learning opportunities for all.